I have just finished watching a documentary on an inpatient hospital for mentally ill teenagers. If I had been viewing this show fifteen years ago, back when I was a teen, I would have had a remarkably different attitude. Back then, I might have cried thinking it was very sad what the kids were going through there, missing out on life. But now, as an adult, I think that those kids are actually very lucky in a sense. These young people are getting on the path to help before they destroy their 20’s with strings of erratic behaviors that they might not have done if stable, or failures from social withdrawal. Their lease on life to dream big and fully pursue those dreams is just beginning through treatment, instead of crumbling from denial of the illness. 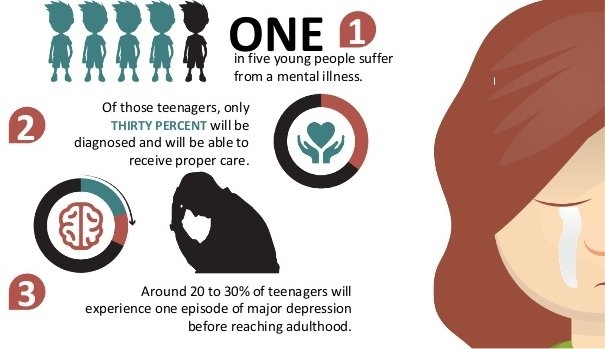 In a world that we are finding out one third of the population has a mental illness, it makes sense that teenagers would be a group that should be getting treatment across the globe. If a child or teen is facing signs of mental illness such as depression, it may not just be a feeling or normal. Organizations like the Canadian Mental Health Association in Edmonton talk about how hard it is specifically for children to seek help for depression . That is why the organization is open to questions about children or teen’s mental health, and these can be directed to their phone line at (780) 414-6300 or e-mailed to main@cmha-edmonton.ab.ca. This non profit can be a branch from which parents and their young ones can find resources regarding mental health. One unfortunate thing that often occurs when teens have problems with mental illness is that their relationships with their parents fracture. The teens project the problem as being their parents’ dysfunction, and can be in extreme denial about their own health. Also, the teens may come from less than ideal backgrounds where their mental health is the least of their current problems. Youth Empowerment & Support Services (YESS) can come in of service here. They house teens and young adults who have been left behind by social services at 9310-82 Avenue. Their website also has a list of resources regarding mental health and substance abuse (which are often intertwined) agencies. I have personally done a brief temping job at YESS helping with their administration, and I witnessed this amazing organization in action. All the staff were overly helpful and kind hearted. The staff cared about the mental well being of teens under their care. And it was truly heartening to see when people donated goods to help the organization, as it is a difficult time for teens to be homeless, let alone the teens there that might suffer from mental illness. Mental illness has a different age of onset in each patient, although there are time frames during which the onset is most and least likely. It is difficult to recognize for those closest to children or teenagers, such as their parents. However, there are agencies and organizations in Edmonton that are waiting and willing to help with the detection aspect. Like I said at the beginning of this article, those that detect illness early are the most fortunate. They then have the rest of their lives to live having already identified something that could be a major set back if not treated. Mental Illness: Is It Really Treated in Canada?